Filipino Beef Steak (Bistek Tagalog) | Love.Food.Asia. 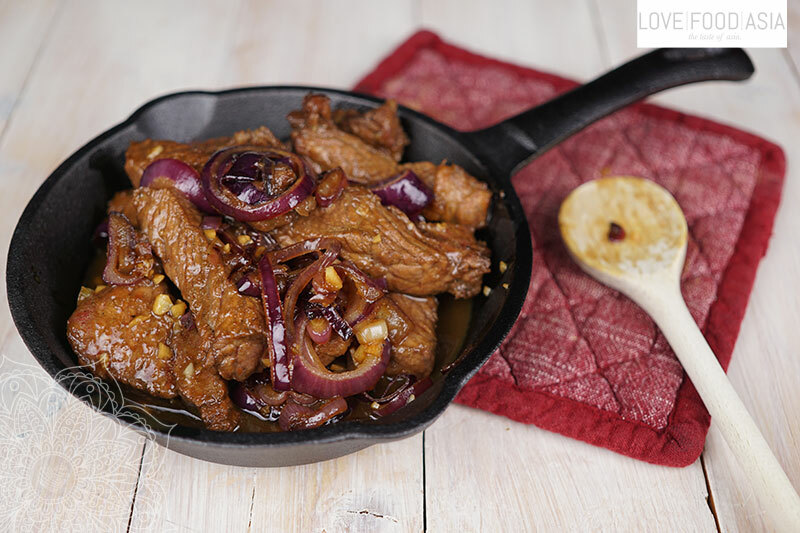 Bistek Tagalog is a Filipino dish made with beef steak and caramelized onions. There is a common dish in Spain and thats where this dish has its roots. The Philippines where a Spanish colony for more than 375 years. Traditionally the beef is marinated in soy sauce and calamansi juice (read note below) juice. In our recipe we use lime juice instead of calamansi juice. This simple dish is popular in the Philippines and we show you how to make your own Bistek. In a non-metal bowl, mix lime juice, soy sauce, and garlic. Taste. If it is too sour add soy sauce. if it’s too salty add more juice. Season with ground pepper. Add meat to soy sauce mixture and stir to let it soak up the marinade evenly. Let it marinade for at least 30 minutes. Heat a skillet. Add one tbs oil. Stir fry onion rings until translucent. Remove from skillet and set aside. In the same pan, heat one tbs oil. Pan-fry the beef working in batches, remove after browning on both sides. Pour marinade into skillet and bring to a slow boil and simmer for a few minutes or until cooked through. Adjust sauce with more soy sauce or juice, or some water, to suit your taste. Slide beef slices onto a serving plate, arrange the onion rings on top. Make sure to pour all the rest of the cooking liquid on top. Serve with rice or roti. Calamansi (spelled kalamansi in native Tagalog orthography) is a small, very round citrus fruit that’s ubiquitous in the Philippines. The fruits are often used when the thin rind is still green on the outside, and that is the color associated with it.